Join us for Molly’s Birthday Brunch in Massachusetts on April 9th! Below is a note from Astraea’s friend Molly Girton, who is is turning 34 on Sunday, April 9th. 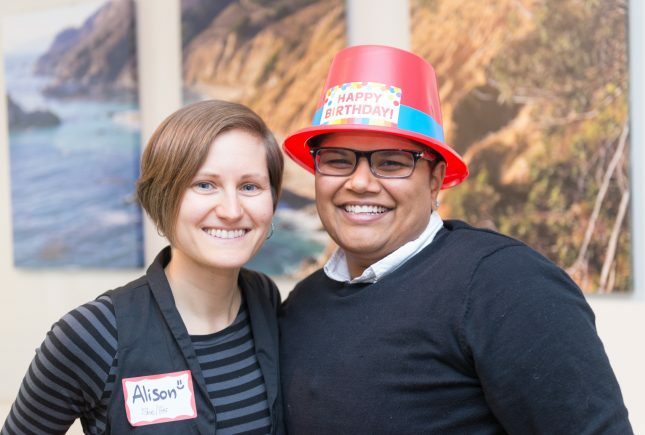 Instead of birthday gifts, make a donation to the Astraea Lesbian Foundation for Justice in Molly’s honor – We’re passionate supporters of Astraea, which resources LGBTQI activists who are fighting racism, sexism, homophobia, and transphobia on the grassroots level. Astraea was founded in 1977 as a response to a challenging political moment similar to the one we are now experiencing! Their work couldn’t be more important to us. Attend Molly’s birthday brunch on Sunday, April 9th – We’ve recently purchased and renovated a home together in Dedham, MA and we’d love to have you over! Please join us for brunch and birthday cake on Sunday from 12:00 to 3 pm to christen the new space. Our good friend Naomi Sobel will also be on hand to discuss Astraea’s amazing work. A note from the web editor: Alison and Molly’s brunch was a wild success! View photos of the festivities here.